Glass Viper is a synthesizer with unique waveform shaping, that has a deep and natural sense of movement. Going beyond analogue simulation, into a truly organic sound, from simple old synths to grungy filthy basses, or delicate pianos to strange unnatural film effects. Glass Viper bends the actual shape of its waveforms through a series of moving control points. ...... Up to four of these swirling and changing sounds can be layered together to create a huge range of instruments. 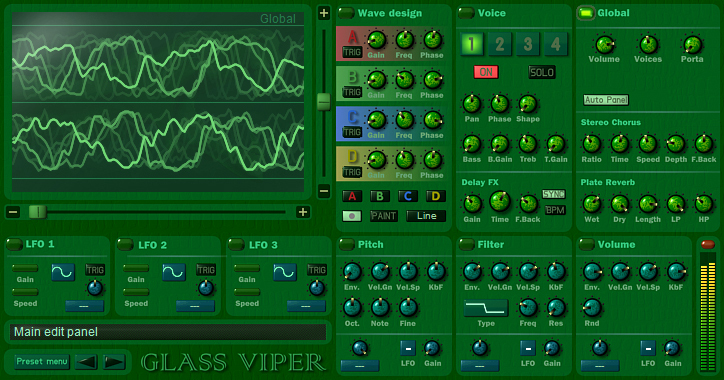 Glass Viper allows you to really shake things up with a deep, natural sense of movement. * 4 editable waveforms, that can move independently during play. * 16 independant LFOs for waveform movement. * 8 bass and treble boost EQs. * 4 unique waveshapers, with distorted top settings. * Multiple copy and paste options for quick editing and layering. * 4 delay lines with BPM syncronisation option. * 12 LFO's with independant speed and gain envelopes. * 4 volume envelopes, with velocity sensitivity for amount and speed. * 4 filter envelopes, using over sampled biquads with up to 24db slope per octave. * Stereo chorus with feedback. * Fusion Field reverb with simple EQ. A multi-player, non-violent arcade game. Simple rules, but addictive play. Modify and change the template to reflect the type of scale model . A free university plagiarism scanning tool for students and teachers. Qweas is providing links to Glass Viper 1.04 as a courtesy, and makes no representations regarding Glass Viper or any other applications or any information related thereto. Any questions, complaints or claims regarding this application Glass Viper 1.04 must be directed to the appropriate software vendor. You may click the publisher link of Glass Viper on the top of this page to get more details about the vendor.